Vermont is the sixth smallest in area and the 2nd least populous of the fifty United States. Medicare data from 2013 show that Vermont had among the lowest hospice penetrance rates in the country along with New York, Wyoming, South and North Dakota, and Alaska. While enrollment in hospice has been associated with improved survival for CHF, colon, lung and pancreatic cancer, improved quality of care for persons dying of dementia, and improved mortality outcomes in surviving widowed spouses, I find knowledge of these research findings to be low. And while a sense of comfort and relief for millions of Americans is provided by hospice every year, it is frequently felt to be a service for the imminently dying. Since beginning my role as Hospice Medical Director for BAYADA Home Healthcare in Vermont and New Hampshire in 2013, I have spoken with health care providers of many disciplines in the region about why hospice utilization may be so low. Hospice practice in rural and remote areas is captured in population based data that can be broken into counties but is poorly represented in hospice and palliative care literature. Its day to day challenges and successes are learned from actual and shared experience. This #hpm chat encompasses an international group of participants who bring a diversity of experience to the topic of building high quality and lasting hospice programs in rural areas. My aim is to pose questions that will lead us to common ground for building these programs in order to meet the end-of-life needs of our patients, families as well as hospice clinical and administrative staff. How is access to hospice care a barrier for patients and families where you live? How is the availability of experienced staff a barrier? Have prescription monitoring programs or pharmacy dispensing practices interfered with your ability to dispense opioids? Dr Saroyan (@jmsaroyan) is the full-time Hospice Medical Director for BAYADA Home Health Care. He also holds faculty appointments at Geisel School of Medicine, UVM Medical Center, and Columbia University. Hospice and palliative care professionals value honesty. We may be the only people in a patient’s life who speak openly about death and dying. There is no time left for us to speak metaphorically. We do our best to be compassionate when we are direct with our communication. In order to provide the best care possible for our patients, we have to build an open and trusting relationship with them. One might assume that since we are authentic with our patients, they are open and honest with us. We know, though, that this is not always the case. Recently, I wrote about the secrets of hospice patients. This article is a continuation of that thought with a discussion of the lies that hospice patients might tell us. Before we go on, let's be clear that there is no moral high ground in the suggestion that hospice patients may lie. A lie, according to Webster's Dictionary, is simply "an intentionally false statement." It is my assertion that there are times where patients do make false statements to us, and they have their reasons for not being truthful. If you are new to hospice and palliative care, you might be surprised to learn that patients might lie. If you have worked in hospice and palliative care for a few years, chances are you are nodding your head as you are reading this, with a recollection of your own patient encounters. I have been thinking about this phenomenon for a few years. As always, my articles are inspired by experiences and lessons I have learned as a hospice social worker. Why do hospice and palliative care patients lie to us? Perhaps the best way to answer the “why” is to reframe the question. When might hospice and palliative care patients lie? 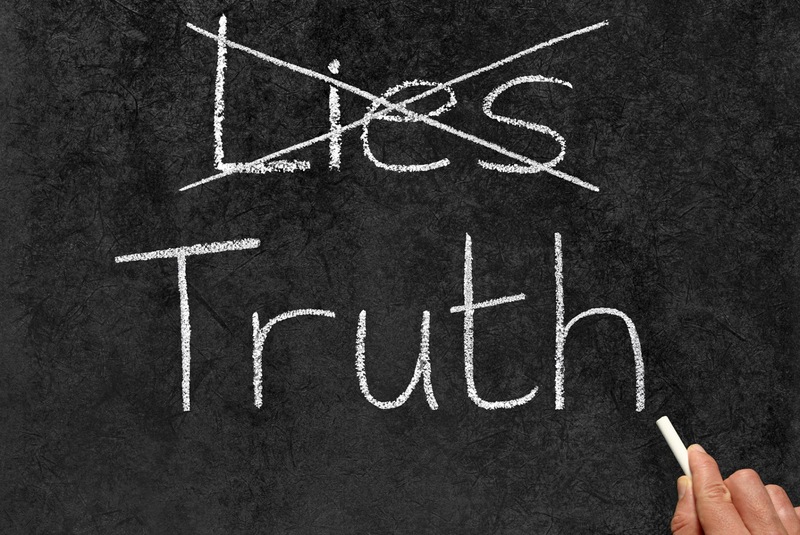 Patients might lie when they do not feel comfortable with telling us the truth. We have not built up trust so that the patient feels we are on their side. Patients may outright lie or they may lie by omission or understate the truth. There are several reasons why a patient may not be honest to a hospice caregiver about their smoking, drinking or drug habit. 1. Patients expect that their medical provider will tell them to stop what they are doing. 2. There is a fear of judgement/labeling by the medical provider. 3. Patients may not think their habit is the provider’s business. 4. A patient is ashamed or embarrassed by the habit. 5. There may be a perception that a truthful answer will result in an unwanted response from the provider. Patients are not going to naturally understand why we ask questions about smoking, alcohol and drugs. We ask these questions because these habits can affect their plan of care. All three habits can affect how a patient responds to or metabolizes medication. If a patient is a smoker, we want to ensure that they are safe with their habit, especially if they are on oxygen. 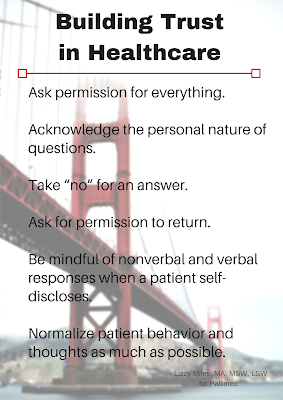 Before we ask questions about these habits, it would be helpful for the patient to know why we are asking. If we tell them why we need to know about their habits, we have a better chance of getting an honest answer. In hospice and palliative care, we are constantly assessing. Every staff member that interacts with the patient is asking the patient questions. At times, the patient gets the same question from different staff members. A barrage of questions can be overwhelming for patients. We need to be mindful of the timing of our visits so that patients have a break in between providers as much as possible. I had one initial assessment with a patient (Mr. J) which directly followed personal care by the aide and the hospice nurse visit. (Hospice social workers are tasked with conducting an initial assessment within five days, and so our timing can be unfortunate at times.) The patient I was assessing was irritated with his shower because movement hurt and he was in a bad mood when I started talking with him. I could not get a straight, honest answer on any question. He told me he had ten children, when in fact he had none. He refused to tell me what he did for a living. Every other word he said was a swear word. He was not in the mood to talk, and eventually, I gave up trying to win him over and gave him the space that he apparently wanted. Sometimes our experiences when we are patients ourselves can inform our work. It took me three months to get in to see an opthamologist, and then the day of my visit, there were extensive wait times with no updates or apologies. The whole appointment took 4 hours, although my physician time was only 20 minutes. I was seething inside, yet I never complained. I felt helpless because I really needed to see this specialist. You would think I would be better at self-advocacy since I'm a social worker. Though I never said anything to the doctor, you can bet I told a number of people how awful my experience was. It was then that I realized there might be some of our hospice patients who don’t like us or something we have done, but don’t tell us. Why am I bringing this up? Because we need to remember that a patient is not always going to tell us directly when they are unhappy about something. Occasionally, one staff member will hear from a patient about their dissatisfaction with another staff member, but I suspect there is more dissatisfaction than we realize. A complaint-free patient does not mean we have a content patient. We need to check in with the patient frequently, and give them the opportunity to direct their care. We do not want to have a situation where a patient is very unhappy and we did not know because they didn’t tell us and we didn’t see it. We need to read body language and we need to read between the lines with what patients say and what they don’t say. • Ask permission for everything. Are you open to chatting? Do you mind if I take notes? • Take “no” for an answer. If a patient does not want a visit, I leave. • Ask for permission to return. 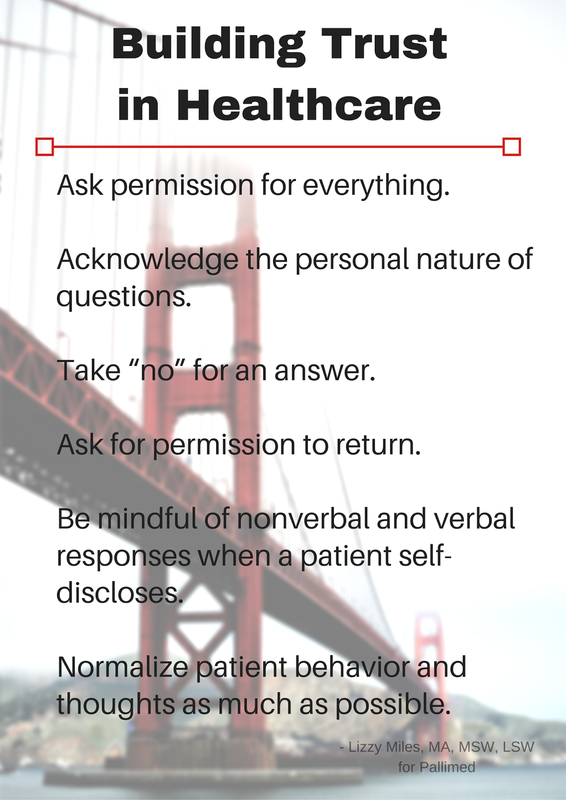 • Be mindful of my nonverbal and verbal responses when a patient self-discloses. • Normalize patient behavior and thoughts as much as possible. Please do share in the comments your own best practices for building a trusting relationship for patients. SM is a 25-year-old female with progressively worsening rhabdomyosarcoma despite multiple rounds of chemotherapy and surgery. She presented to the emergency department with worsening of her chronic tumor-related abdominal pain and new, diffuse pain of the muscles and joints. Family reported she had been experiencing episodes of confusion and hallucinations over the past week. Her home pain regimen of long-acting morphine and as needed oxycodone had been titrated aggressively over the past month in an attempt to control her pain (600mg total daily oral morphine equivalents). When first evaluated by the palliative care consult service, she was in severe distress. She described severe, 10/10, diffuse pain. On exam there was generalized tenderness of the abdomen, as well as her shoulders, upper legs, and lower back. She was exhibiting myoclonic jerks of her upper extremities every 3-4 seconds. Although she was alert and oriented, she was easily distracted during the exam and required frequent redirection. 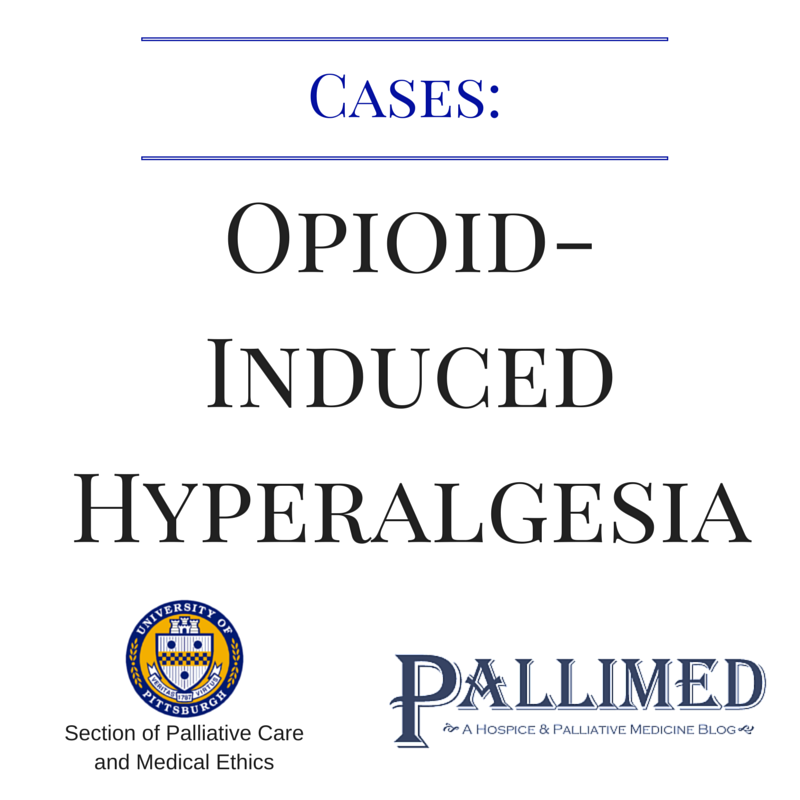 Our palliative care team was concerned about opioid-induced hyperalgesia (OIH). Suspicion was high given the paradoxical worsening of her pain despite high doses of opioids and the neuroexcitatory signs and symptoms (myoclonus, confusion, and hallucinations) she was exhibiting. Therefore, it was decided to lower the overall dosage and switch her opioid regimen in an attempt to reverse OIH. Her long-acting morphine was discontinued and replaced with methadone 5mg three times per day. Her as-needed oxycodone dose was reduced from 30mg to 5mg every 4 hours. To control the myoclonus, low dose lorazepam was administered three times per day. 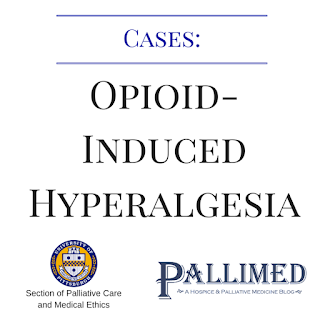 Opioid-induced hyperalgesia (OIH) is a rare syndrome of increasing pain, often accompanied by neuroexcitatory effects, in the setting of increasing opioid therapy. Clinicians should consider OIH in patients on high dose opioids or during a period of rapid opioid escalation. While case reports show a wide range of dosages can provoke this syndrome, the majority of patients are on very high doses, often greater than 1000mg oral morphine equivalents per day and typically via parenteral routes (IV and intrathecal). Morphine is by far the most common opiate implicated in OIH. Hydromorphone and oxycodone, members of the same class of opiate as morphine (phenanthrenes), can also cause OIH, but oxymorphone has not yet been reported to cause it. Methadone, a synthetic opioid in the class of diphenylheptanes, and fentanyl, a synthetic opioid in the class of phenylpiperidine, are considered less likely to precipitate OIH. OIH can be confused with tolerance as in both cases patients report increased pain on opioids. The two conditions can be differentiated based on the patient’s response to opioids. In tolerance, the patient’s pain will improve with dose escalation. In OIH, pain will worsen with opioid administration. This paradoxical effect is one of the hallmarks of the syndrome. On physical exam, patients are grimacing in pain with moderate-to-severe distress, myoclonus, altered mental status or delirium and often allodynia (pain due to non-painful stimuli, such as light touch). Typically, if you suspect OIH, you should get a pain or palliative care consultation because it will seem wrong to decrease opiates in a patient in severe pain. Opiate dose reduction and rotation to a synthetic opioid such as fentanyl or methadone is recommended. Methadone has the additional benefit of NMDA antagonism. It is not surprising that methadone has been shown to improve or resolve OIH given the role NMDA activation plays in causing OIH. Adjuvant therapies, such as acetaminophen or neuropathic pain medications, should be considered as they may decrease the need for opioids. Benzodiazepines may be a temporary addition to manage myoclonus as the OIH resolves. Symptoms of OIH do resolve when patients are treated with the above strategies. However, it can be long and difficult to wean some patients to a low enough level of opioids to stop OIH. Existing literature does not address any long-term consequences of OIH. We hope to see more research on this subject. Over the next 48 hours in the hospital, her myoclonus improved. Her pain and mental status improved more slowly. It took a week to re-establish control of her pain. At the time of discharge, she rated her pain as 3/10. Her new pain regimen consisted of methadone 10mg three times a day and oxycodone 5mg every 4 hours as needed. 1. Chu, L. Opioid-induced Hyperalgesia in Humans: Molecular Mechanisms and Clinical Considerations. The Clinical Journal of Pain Issue: Volume 24(6), pp 479-496. 2008. 2. Smith, M. Neuroexcitatory Effects Of Morphine And Hydromorphone: Evidence Implicating The 3-GlucuronideMetabolites. Clinical and Experimental Pharmacology and Physiology, 27, pp 524–528. doi: 10.1046/j.1440-1681.2000.03290. 2000. Pallimed Case Conference Disclaimer: This post is not intended to substitute good individualized clinical judgement or replace a physician-patient relationship. The case and discussion is published as a means to illustrate important teaching points in healthcare. Patient details may have been changed by Pallimed editors to ensnure anonymity. Links and minor edits are made for clarity and Pallimed editorial standards. 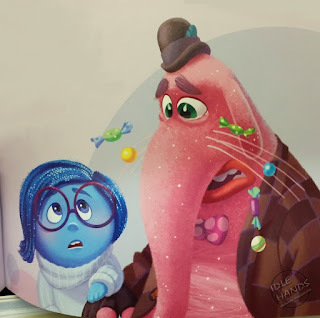 I heard these words from a 9-year old at the end of an NPR story on Pixar’s new film Inside Out. (Note: that the audio has more than the webpage written content.) I thought to myself: There is a movie explicitly about emotions? About the importance of what so many deem to be “negative” emotions? What?! I need to see this movie. How can this movie be used within palliative care? With these reviews in mind, our palliative care team went to see the movie together recently. The movie lived up to the expectations set for me. I can imagine using the “characters” (emotions) to help explain the mixed feelings encountered in the word of palliative care. I’m also still smiling at the scene in which Sadness sits down and listens to the life review of an imaginary friend named Bing Bong… She doesn't say much at all, but afterwards he is amazed about how much better he feels. Palliative care anyone? Jenni Linebarger, MD, MPH, FAAP is a pediatric palliative care physician at Children's Mercy Hospital in Kansas City, MO.